At Dauphin Clinic Pharmacy we like to keep our patients informed by continuously providing them with interesting health articles, links to important health related information, compounds of the month and audio that you can conveniently listen and learn about a wide variety of health topics. Health Articles offer a wide range of health information on common diseases, nutrition and vitamin supplements, promoting healthy living, health program information such as "Quitting Smoking" and so much more. We also have a convenient search tool for the health articles that allows you to filter the articles based on your topic of interest. Links provides information to reputable third party news sources, which provide an excellent resource in the areas of general health information. 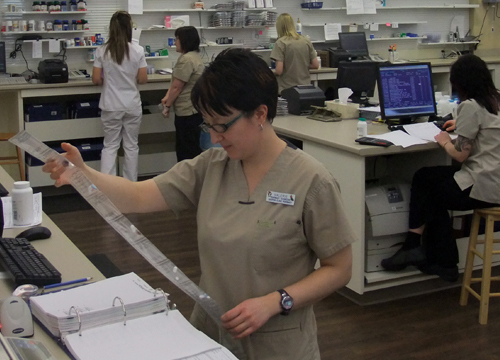 At the Dauphin Clinic Pharmacy, we are always looking for ways to help our patients. One way we can help you is through compounding. Compounding is when a pharmacist modifies or mixes a medication for a specific patient with a prescription from that patients prescriber. Common reasons to compound a medication are to get a non-commercially available dose, to get a medication into a patient by a different route or to re-create a medication that is temporarily or permanently off the market. We invite you to visit our Compound of the Month section to learn more about the compounds that can be provided by Dauphin Clinic Pharmacy. We also offer an Audio section that allows you to conveniently listen to a wide variety of interesting health related topics. We takes great care in providing easy to understand information that helps our patients healthy lifestyle products and services based on best healthcare options available through the Dauphin Clinic Pharmacy.